Do you keep quiet about the dreams and desires that would make you happy? Maybe now is time to start fulfilling those dreams! A good step in that direction is to create a Bucket List - a list of dreams, aspirations, and goals. We are going to help you to create it and to fulfil your life-long dreams as well! Close your eyes and try to reflect on your life so far as if it were a movie. If today was your last day, would you really be happy with your life? What is missing from the movie version that played out in front of you? What would you regret? Things you did or the things you wanted to do, but never got around to? According to polls, people usually regret what they didn’t do, rather than what they did. Most asked said they would improve their loving, family and friend relationships. Other participants in the US survey admitted that they later regretted their unfulfilled career aspirations, their choice of education, and unfulfilled traveling dreams. Many were sorry that they never became involved in charity, they have always been worried about money (which they have never enjoyed) and didn’t leave their comfort zone due to fear of the unknown. You are probably now saying, ‘It’ll never happen to me, I will fulfil my dreams before I die”, but what steps have you taken so far to make that true? Maybe it’s time to create your personal list of dreams, plans and desires – your Bucket List – so that you won’t regret a second of your life. What is a bucket list and where did the term originate? The Bucket List is nothing but a list of all the dreams, aspirations, goals, and experiences that somebody wants to achieve in a lifetime. The bucket list of each person is unique, it should reflect their inner world and desires. You can include all the small and big things that would fill your life, enrich it, shake it up, and bring you the kind of joy that makes life worth living. The phrase "bucket list" can be translated as "a list of wishes to complete before dying" from the English phrase "kick the bucket." The bucket list is therefore a list of things anyone would want to do over the course of their life. At the beginning of the current phenomenon was the movie ‘Bucket List’ which starred Morgan Freeman and Jack Nicholson. The movie came out in 2007 and covers the last few years in the lives of two men suffering from fatal illnesses who meet in hospital. Together, they write a list of their still unfulfilled dreams and embark on an adventurous journey through which they try to experience everything life has to offer before it’s too late. 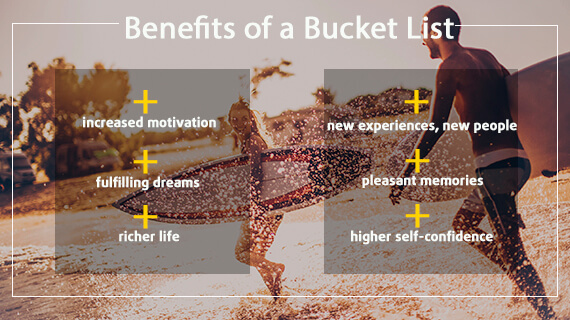 Even though the term bucket list is derived from a not very positive phrase related to death, it is possible to create not only the life list of your dreams but also the plans and goals you want to experience over a certain period of time. You can invent your summer bucket list, a bucket list of things to do before your 40th, a bucket list for your wedding day, and so on. In fulfilling your dreams and desires, you are not bound by any limits. Just like in the famous movie which brought the idea of a bucket list to the forefront of peoples’ minds. The Bucket list can inspire and enrich you, making it easy to get motivated about reaching your goals. By creating a list of your desires, you will start a motor that will keep on running. The Bucket Sheet will give you courage and energy to make even the most bizarre plans move closer to reality. It can get rid of procrastination, it will give your life some sense and reduce the risk of burnout. What's more important, the bucket list will help to make you some unforgettable memories, and if your family or friends are also part of it, it will make life even more enjoyable for both you and your loved ones. Bucket List - Who creates them and why? A Bucket List can be created by anyone, anywhere and anytime. It doesn’t matter if you are 19 or 99; if you have dreams or desires in your heart, create your own bucket list too! According to statistics, up to 46% of baby boomers (those born between the 1940s and 1960s) have written a list of life dreams. It says everything: age really doesn’t matter! Adults can dream too. 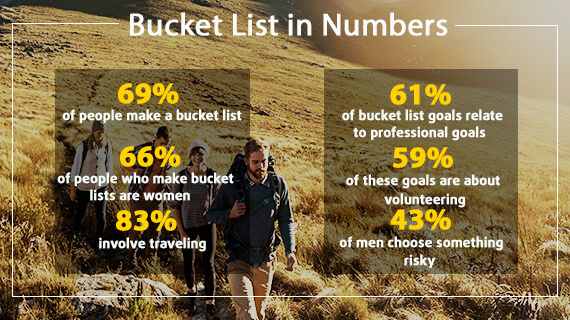 According to the Hilton Garden Inn study, up to 69% of people have written a bucket list or dream list, and of that group it is estimated that up to 66% of them are women. Other data collected from this survey suggest that 83% of people have a list of places they’d like to visit, 61% a list of professional goals, and 59% put volunteering at the top of their bucket list. Interestingly, men tend to pick more extreme or risky experiences than women (43% of men versus 28% of women) in their bucket lists, while more women choose volunteering (65% of women versus 53% of men). 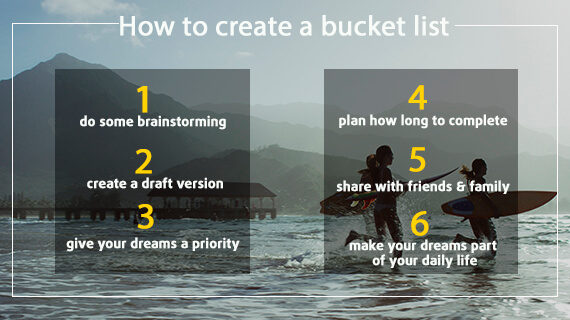 What should a Bucket List contain? Your personal bucket can really contain anything. All the brave (and not-so-brave!) plans and dreams that have been in your head for years. However, you should also take into account external circumstances such as your family and loved ones, you certainly don’t want to hurt anyone, or lose anybody from your life. Take into account your health and, of course, your financial situation. However, this does not mean that you have to give up your dreams or goals just because you are not in the best financial position right now. On the contrary, write down everything you want. Things that require a whole lot of money, may need to be re-vamped, possibly you can create a more expensive dream along with a cheaper alternative when you make your list. On the bucket list, write down what you want to achieve, what you want to do, where you want to go, and even the things that matter to you. Be careful, a bucket list is not a shopping list, it's not about the things you want to own, but about the experiences you want to enjoy. You can save your list to your computer, notebook or diary, mobile, mobile app or online to your blog. You could even just write it down on a piece of paper! The Bucket List is an excellent way to help you to fulfil your wishes. You don’t have to study esoteric guides, telling you to make wishes to the universe so that your dreams will come true. Just think about what you deserve, write a wish list and embark on the hard fight required to make your dreams a reality! Now let’s go through the steps required to create that bucket list. Think and remember. What did you dream about a few years back when the world was a little younger and you could afford to have your head in the clouds? Do you still have a relationship with those dreams? Think about what you lack in life, and how you could fill that gap. Include dreams, aspirations, goals, plans, and activities you want to address. Take your paper and pen (or smartphone or computer) and write down everything you can think of. 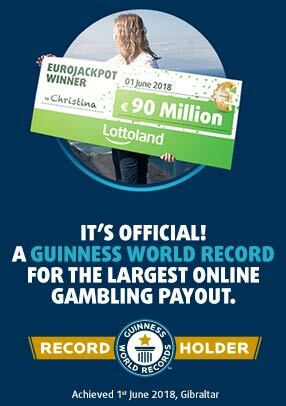 It may be something you have never tried before, but are you embarrassed by the idea of ​​trying it out in future? Put it down on paper! Do you need to learn English? Put it down too. Don’t be afraid to write down every single dream and desire. At first, create a rough list of your dreams and include absolutely everything you can think of. You can make some changes later on if need be. Read your rough list and give every single dream or goal a score from 1 to 10 points depending on how much you want to achieve it. Carefully reduce your list based on those scores. If you realise that something is not that important to you, just throw it away. At the beginning of the list, put only the things that you from the bottom of your heart. These are the ones which have earned the most points. From the other things which scored fewer points, you can make an extra bucket list. The Bucket List is not just about creating a list that you put in a drawer. On the contrary, it is not really a list at all. It's about which of your dreams you really can achieve and how happy they would make you. After writing down your list it is therefore advisable to take a step back and look at your plans a little rationally. For each dream, write down the time you would need to achieve it. Think about what you would need to be able to fulfil this dream. Do not forget to put price tags on your plans. How long would the trip to Iceland take, how much will the Spanish lessons cost? Why not involve your friends, family and acquaintances with your bucket list project? This is where the internet comes in handy. If you don’t own a personal blog where you can record your successes, you will be helped by different sites such as bucketlist.org or bucketlist.net, which serve as a virtual platform where you can share your dreams with others and watch as you are progressively achieving them. Comparing with others can inspire and motivate you. But this is not the end, it’s the beginning! Incorporate dreams and goals into your life, adjust your daily schedule, save, plan. Don’t rest on your laurels with your list of beautiful dreams, now you need to go out there and live your dreams. Do you want to learn a new language? Sign up for a course, open an online account on one of the language portals (like Duolingo) or buy a self-book book. Make a little bit of time each day for your dream. Every single step is good, no matter how small. If you get the dream done, cross it off your list and focus on the next one. The reward will give you a wonderful experience that will be written into your memory forever. What dreams do other people have? 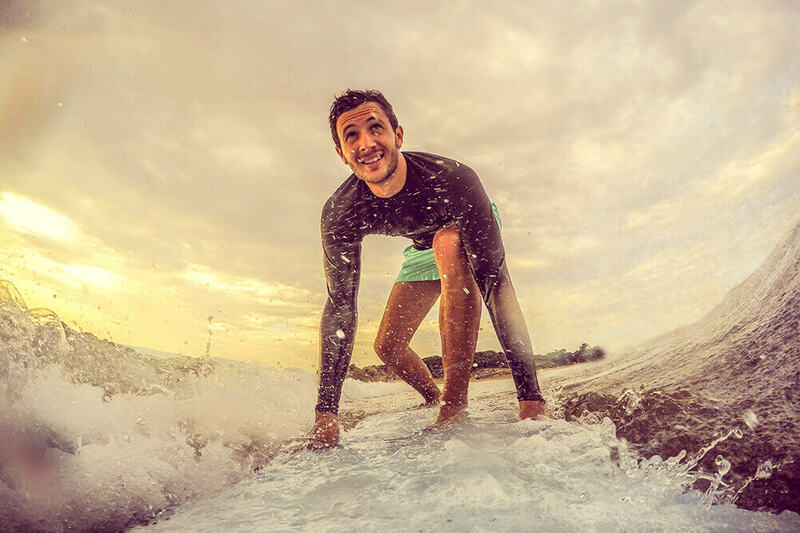 According to the bucketlist.org site, where more than 600,000 members share their more than 6 million dreams, these are among the most popular desires: swimming with dolphins, learning a new language, seeing the Northern Lights, going on a boat trip, sky-diving , falling in love, marrying, and so on. Among the most popular travel plans, (which make up more than 80% of the dreams), are: Niagara Falls, the Grand Canyon, the Great Wall of China, Sydney, Safari in Africa and many more. Do some exploring for yourself and see if you become inspired!